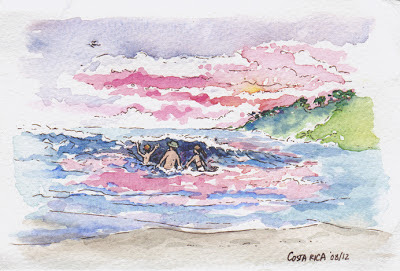 Last summer my family had the very good fortune to be able to go to Costa Rica for a 2 week holiday. We had an absolutely amazing time traveling from San Jose to the volcano at Arenal, the hilly cloud forest of Monteverde, the beaches of Manuel Antonio and finally the super-remote Corcovado National Park on the Osa Peninsula. 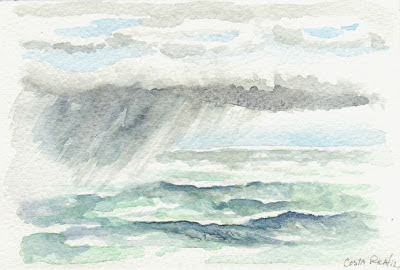 There wasn't that much time to draw or paint but I did save these two little 4"x6" water colours. The first one of our family I painted back at the hotel as we had all left our cameras behind to make it easier to swim in the gigantic Pacific Ocean. The sunset looks ridiculously exaggerated with cotton-candy clouds but I assure you it's understated compared to the true scenery which had an unbelievably grand stretch of pink sky reflected in the water, and facing it, a rainbow! I kid you not. The Osa Peninsula is incredibly remote - it takes hours by muddy, partially-submerged road to get there, an area where the trees are filled with flashes of red wings and screeching sounds of wild Macaws and jaguars still prowl the rain forests like ghosts. 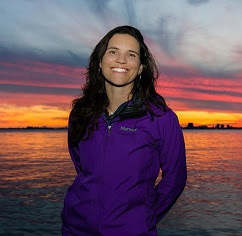 The ocean is much too wild for swimming - aside from sharks and rip tides, waves as tall as houses crash onto the beach and giant storm clouds threaten with rolling thunder and flashes of rain. 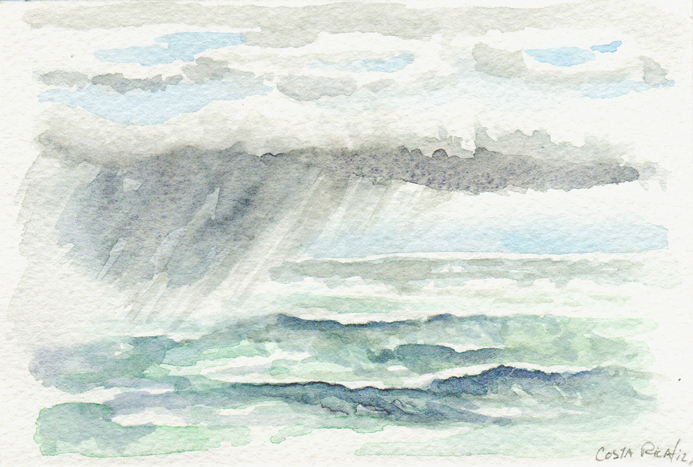 The awesome sight is just impossible to capture on a tiny postcard but picture the dark clouds pulling rain like a curtain across the sky over the pummeling surf. Amazing!